After the vital matter of lighting, there follows a second issue, which is no less important: heating. You must first establish your requirements. The aquatic animals and plants in tropical regions live in warm water in which the temperature hardly varies over the course of the year. Tropical aquariums must therefore be heated, with the temperature guaranteed at around 25-26°C, or even 27°C for sea water. These temperatures can be maintained with a watertight electrical heater connected to an adjustable thermostat that switches itself off once the desired temperature has been achieved. When the latter goes down by 1°C or less, the thermostat reconnects the current and the heater starts to heat up again. 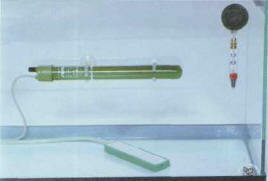 Classic ther mostats for aquariums allow the temperature to be regulated with some precision, to around 0.5°C. More precise electronic thermostats are also available. These react to variations of the order of 0.1°C, but unfortunately they are more expensive. Once you have established your requirements, the next step is to choose the problem of the heating equipment. There are independent elements available, attached to a thermostat, but they have the disadvantage of multiplying the number of electrical connections and cables to be hidden. Independent thermostat and heater: practical, if you want to modulate the power of the heating, but unwieldy as regards electrical cables. Another option is a heater-thermostat - combining both a thermostat and a heater - which is completely watertight and submergible. This system is becoming increasingly popular as it is so easy to use. Finally, a less common type of element consists of a heating cable sealed inside a flexible tube, which is placed in the sediment. Some aquarists, however, think that the diffusion of heat via the bed damages the roots of plants. Furthermore, there is a danger that the cable may be partially unearthed by a burrowing animal in the tank. 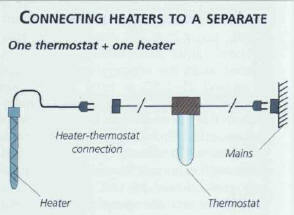 A heater-thermostat is the most practical solution for beginners. Make sure to choose a model in which the temperature readings are clearly visible. They often have a small light which indicates when the element is heating up. The power depends on the volume of water the aquarium will hold: calculate around 1 W/liter, which means that a 100 liter tank requires a heaterthermostat of 100 W.
A heater-thermostat must always be totally submerged. The temperature in an inhabited room - a lounge or bedroom - rarely falls below 17°C. If an aquarium is installed, the heating must be sufficiently powerful to go from this room temperature, which will be the same as that of the unheated tank, to one of around 25-26°C. A power level of 1 W/liter is generally sufficient to ensure this increase in temperature. 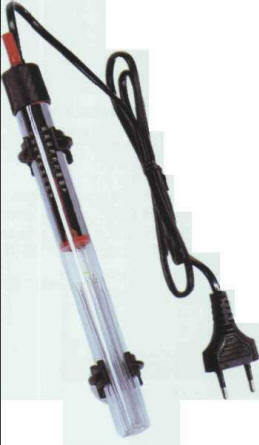 Therefore, 100 W will be required for a 100 liter aquarium, and this will also suffice for a 150 liter tank. In an uninhabited, and usually unheated, setting, such as a garage, cellar, or loft, a tank sometimes requires up to 2 W/liter, but rarely more than this. The thermostat must be placed some distance away from the heater for an adequate control of the temperature. There is a sufficiently wide range of heating devices and power levels to cover all your needs for volumes up to 500 liters (25, 50, 75, 100, 150, 200, and 500 W). Beyond that, it is cheaper and easier to heat the entire premises (as in the case of clubs and public aquariums) than to heat tanks individually. 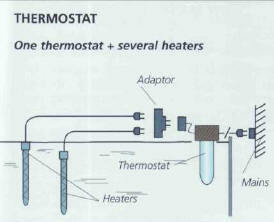 It is important that the heat discharged by the heater is spread throughout the aquarium, in order for the temperature to be relatively uniform. Therefore, put the heaterthermostat in a turbulent spot, to help spread the heat and prevent any areas being warmer than others. Another alternative is to distribute the heat by dividing the overall intensity - two heat sources of 100 W instead of a single one of 200 W, for example - but this entails more cables to hide, both inside and outside the aquarium. 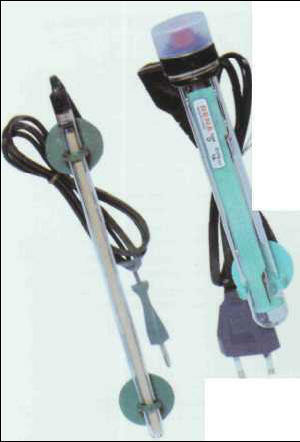 The thermometer must be kept away from the heat source, to avoid being directly affected by it. Sometimes, the glass protecting a heating apparatus may break, especially when you are handling it, and so it must be replaced. However, before plunging your hand into the aquarium, it is essential to unplug the heating system, as there is a risk, however minimal, of getting an electric shock - water, particularly salt water, is an excellent conductor of electricity. 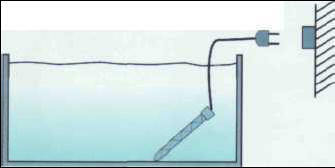 The heater's heating wire can break, meaning that the water is no longer being heated and gradually cools. In this case, an internal black deposit appears in the heater, or on the heater component of the heater-thermostat. Another common problem is the blocking of the thermostat in the heating position: the metal strip "sticks" to its contact, the element continues heating, and in a few hours the temperature of the tank can soar above 30°C. This can occur with well-used thermostats, although the problem can be avoided with a second thermostat, inserted as a safety measure between the first and the mains supply. If in doubt, consult a qualified electrician who has experience in dealing with domestic aquariums or your local supplier. 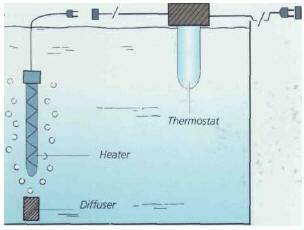 A diffuser placed under the heater-thermostat distributes heat throughout the aquarium. НОВГОРОДСКОЕ ВОССТАНИЕ 1071 , возглавлялось волхвом. Защищая епископа, князь Глеб Святославич убил волхва и усмирил восстание.